The Winter Games are here! Of course, Omega resumes its role as the Official Timekeeper of the Olympics—a responsibility they’ve had since 1932—making this the 28th time the Swiss company is in charge of timing the games. And with the partnership comes plenty of Omega PyeongChang 2018 limited edition watches. Let’s get a closer look. Let’s take a look into the Omega collection of watches. First up, we have the limited edition Seamaster Planet Ocean “Pyeongchang 2018″ dressed in the flag colors of the host country, South Korea. Limited to 2,018 pieces (naturally), the commemorative Planet Ocean diver’s watch sports a 43.5mm stainless steel case with a blue ceramic dial and blue ceramic unidirectional bezel where the first 15 minutes are made from red rubber. Continuing the color theme is the blue rubber strap with red stitching, while the transparent caseback features the text “PyeongChang 2018” and the famous Olympic Games logo. Behind the inscription, the Master Co-Axial Caliber 8900 automatic movement is visible. 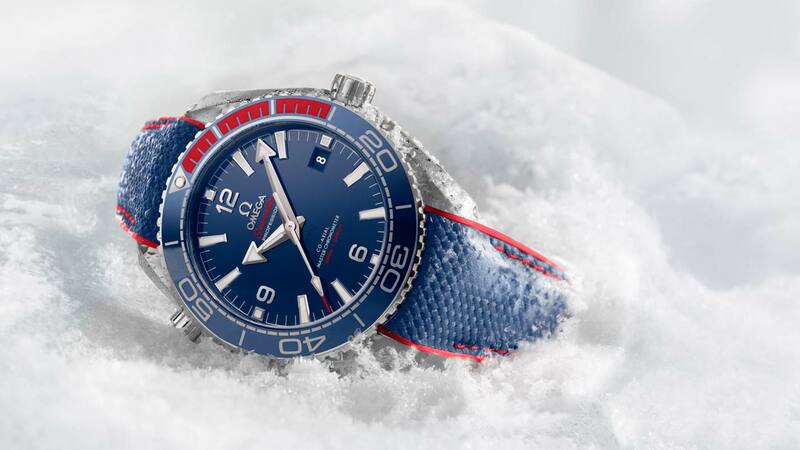 Also limited to 2018 pieces, the Seamaster Aqua Terra “Pyeongchang 2018” Limited Edition keeps its tribute to the Winter Olympics subtle with small, yet colorful “PYEONGCHANG 2018” text added to the minute track around the periphery of the blue teak-motif dial. Maintaining the signature design of the Aqua Terra 150M collection, this commemorative Omega Olympic model includes a 41.5mm stainless steel case. There’s also the “PyeongChang 2018” and official Olympic logo on the exhibition sapphire caseback protecting the Master Co-Axial Caliber 8500 within. 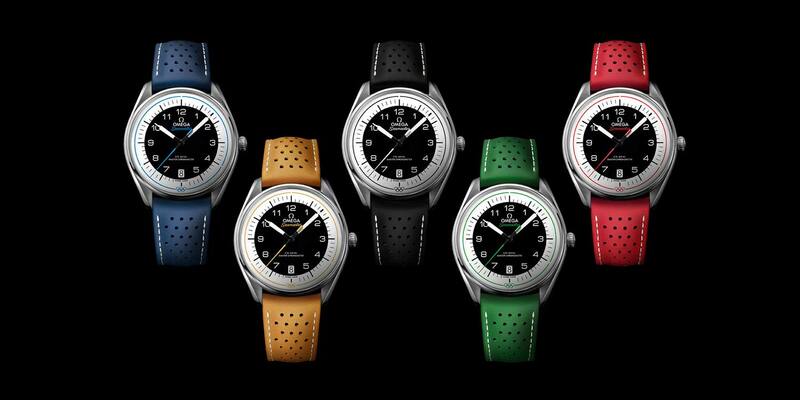 Inspired by vintage Omega stopwatches used to time the Summer Olympics in Montreal and Winter Olympics in Innsbruck in 1976, the company recently unveiled a colorful collection of Seamaster Olympic watches. Since Omega signed a 100-year deal with the Olympics in 1932, the partnership will continue until 2,032. Therefore, Omega has produced 2,032 examples of each color variant. 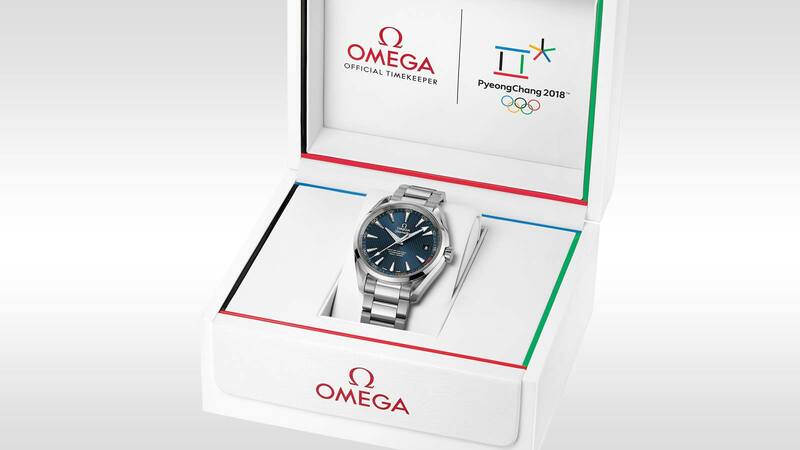 Plus, the caseback of the watch lists host cities where Omega has been the Official Timekeeper of the Games, along with future known cities up until Los Angeles 2028. To celebrate the three types of medals bestowed upon the best athletes in the world, Omega has created the Seamaster Olympic Games Gold Collection with a yellow gold version, a white gold version, and a red gold version. The simple time-only dials feature the vintage Omega logo and the vintage Seamaster font set upon the eggshell white enamel surface, along with striking gold faceted indexes and the leaf-style center hands. While the face of the watch doesn’t indicate any tribute to the Games, the caseback does include the same list of Olympic host cities encircling the sapphire crystal shielding the Omega Master Co-Axial 8807 movement. 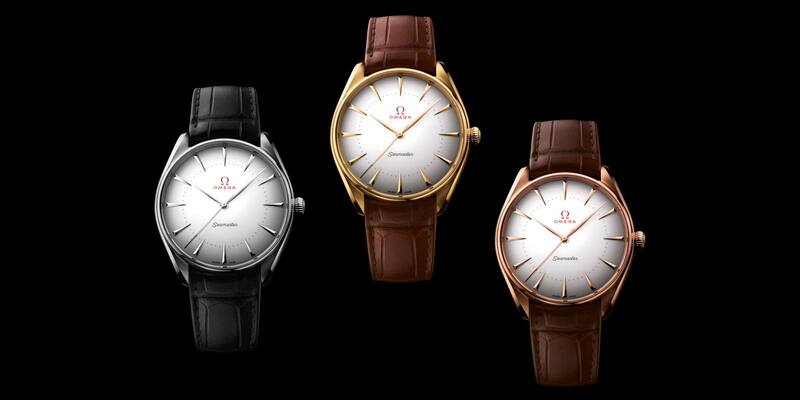 To accompany the three gold versions, Omega has also released a platinum edition limited to only 100 pieces. What do you think of these Omega Olympic watches? Would you wear them? Sound off in the comments section below.